A 19th minute goal, netted by Akeeno Hazelwood, separated the two outfits, and gave the home team the triumph. Hazelwood made good of some defensive lapses by the Dominicans, and was able to beat the Dominican custodian, Glenson Prince at the near post. It was the first glimpse the Vincentian public was getting of the new look senior team, as the two previous friendlies versus Antigua and Barbuda were played in Antigua, and their first leg Group E match against Guatemala, on September 2, was played in Guatemala City. Most of the members of the local team are products of the 2008/2009 national Under-20 team and the most recent Under-23 unit, which participated in the Olympic Qualifiers in Suriname last month. Rowe said that he and his technical staff used last Sundayâs match to see as many players as they could. Rowe and his fellow technical officials called up several other players who did not make the Central American journey. âWe played some different players in positions which would not have played them, and that was evident in the second half as we were not all that as a unit,â the TD stated. âWe wanted to give some more players a run out, but with a one nil margin, we could not. I wanted to see the other goalkeeper, but if we had scored another goal, he would have been out in,â Rowe added. âIf you ask me, we should have been three or four goals up in the first half and should have scored at least another two in the second half,â Rowe reflected. The Technical Director and Head Coach said in the main, the warm up match met its objective, but he expected a little more competition from the Dominicans. Both teams are coming off losses in the opening encounters of the Concacaf Qualifiers. 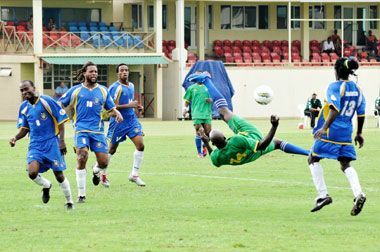 St. Vincent and the Grenadines was beaten by Guatemala 4-0 in Guatemala City, while on that same day, Dominica lost to Nicaragua 2-0. St. Vincent and the Grenadines was without the services of the most experienced players Shandell Samuel and Cornelius Huggins, who are both nursing injuries; however, they are expected to be fit for this Sundayâs meeting with the Grenadians.